Four of us had applied together, then received our second choice tags, whitetail in Unit 31. But on the Thursday before opening day both Doug and the Oberst had to cancel due to medical reasons. Bad timing for aging to show its effects. Daniel and I left as planned, and arrived just as darkness fell at a spot near Klondyke (unfortunately we’re still in Arizona) where I had camped four seasons ago. Opening morning is always exciting. Anticipation is at an absolute high. A deer, make that a buck, could be detected or could bolt from any of the sparse junipers, or heavily-brushed wash bottoms. However, by 11AM such a scenario had not played out. Two does was the yield at that point. Despite the ever increasing midday heat we pushed our already tiring bodies up one more side canyon, then in a wide loop back to camp. What’s next to impossible to put into words is the strain, bordering on agony, that goes along with climbing or descending in an environment where the sun unleashes its might (temps in the mid-eighties) and where every plant in some way pokes or scratches you while deer remain out of view. By 12:30 we fell into camp, exhausted, bummed, hungry. Hunting hard yielded no rewards. We hid in the shade until at least 3:30PM. Then came a great idea. Hunt smart, not hard. Why not drive on top of the ridge and find a tree somewhere not too far off the road to sit in the shade there, with more country to look over, thus possibly spying a buck. Oh, even better, there was a waterhole up there somewhere. With this heat why not overlook that tank from a shaded location! We grabbed our gear and put the Toyota to work. Indeed a juniper allowed us to wait in shaded ambush for critters to seek water. It was supposed to be simple. That strategic tree was less than three hundred steps from the parked 4Runner. I left the GPS and water bottle, and took a chair instead. By about 4PM we were in position. Nothing showed. Except after some forty minutes two hunters popped over the ridge we’d hoped would bring us a buck, or two. We were forced to change our plans, moved to the next ridge to the southwest. I left the chair under that tree, to be recovered on our way back. The next ridge appeared so-so, but the one after that featured trees right on top, with apparently promising vantage point. A juniper indeed offered such glassing opportunities. We worked our binoculars until the sun disappeared behind the next ridge – and had not seen a thing, not even the other two hunters. Time to return to the SUV. Slipping down the far ridge a little, just in case a deer … There! Indeed, a whitetail was fleeing up the opposite side. In the scope, looking against the bright light on the western horizon, confirming this critter as a buck wasn’t easy. But it was a buck! Now about a hundred and fifty paces across, my bullet was out of the barrel as he slowed a little. Missed – the buck climbed with more vigor. 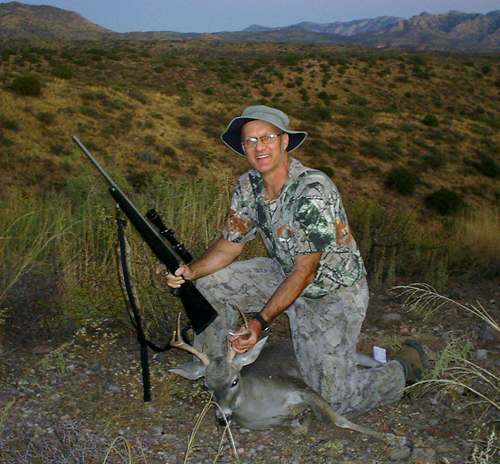 My second shot missed as well – Daniel told me afterwards that he could not find that beast in the scope; it was his first ever deer hunt, his first ever time to aim a rifle at an animal. All I remember about shot number three is that I meant to position the crosshairs to where I thought the deer, now the better part of two hundred paces away, would be in about a half second. Again I immediately cycled the Remington 700 Titanium’s bolt after the shot, but could no longer see the buck running. A search with the Leupold scope revealed something very beautiful, one hind leg kicking in mid air. As made apparent during the red work, one of the misses had cut a groove along the buck’s brisket, with hair missing for several inches. My third .308 Win 150 grain AccuBond had indeed found its target, by first smashing into the deer’s right hind leg bone just barely above the knee, pulverizing both, then slipping into the belly just behind the last rib, missing the guts but slicing through the liver, then on into the lungs, diagonally through his heart, breaking a rib on its way out, and coming to rest right there before entering his left shoulder. The mangled projectile weighed 97 grains. Lucky shot. Speaking of luck, I seemed to have spent it all at that point. A few quick pictures, tagging, gutting, and it was – DARK. Neither of us had a flashlight, they were in the vehicle. Daniel had his GPS on him. But since we had meant to just sit by the waterhole he didn’t bother to mark the location of the parked Toyota. Either way, the deer had to be dragged uphill, towards the road. What may have been a hundred pounds of critter quickly felt to me like a mammoth. Maybe that’s what also made the distance traveled feel like miles. Whatever, eventually we reached ‘the fence’. It was dark-dark now. I instructed Daniel to scout ahead to see if I could drive up to that fence. Well, he disappeared for an uncomfortable long time, only to report that he had gone a long ways without finding the road. Hmm, darn. More dragging, by now suspicious that that ‘mammoth’ was feeding and gaining weight along the way. Frequent breaks burnt more time and residual light. No moon showed up to help us out. Eventually we decided that abandoning the deer in favor of finding the road made the most sense, especially since we made our path more by feel than by sight, not a good situation when plenty of cacti decorate the high desert floor. Daniel did mark the deer’s location on his GPS. Considering that we may have inadvertently paralleled the road instead of heading straight for it, we decided to back track, back to ‘the fence’. After who knows how many yards we gave that up as well. Visibility was now only what the stars and Milky Way offered up. Call it faith, call it reasoning, call it common sense, I concluded that the road that got us here wound in sort of a loop, and that as long as we would keep heading uphill (the horizon was barely visible) we would reach that road somewhere. It may take extra walking distance, but it would lead us back to my 4Runner. So we back-back-tracked, steadily uphill. Sure enough, eventually we stepped onto the road, by our estimations way to the left of the vehicle. But what was this shape to our left?! I could not identify it. But it had to be my Toyota, not thirty five steps away. It was. It was also 7:45PM. Daniel suggested we get the flashlight and go find the deer. I suggested we’d do it right from now on, to drive back to camp, fetch the lantern and a fresh bottle of propane, and then return to find the deer. He agreed. We were both too happy to be re-united with our ride. So neither one of us had the great idea to check the GPS as to how far the deer was from my parked vehicle. Instead we bounced down the road to camp, and returned with the lantern. As we neared the location where we had initially parked to get to the waterhole, Daniel had his GPS tell us the distance to my buck. While I was still driving he began to read out loud the distance: .25 miles; .2 miles; .15 miles; .1 miles – hey, I injected, we ought to find him if he’s that close (I was still driving) – 500 feet; 300 feet… When I finally parked the Toy in that exact spot again, the distance to the deer was 94 feet! That’s right, all we would have had to do is drag him another thirty steps uphill, and we’d have him not only to the road, but right to the vehicle. Daniel with his GPS found him before I had the new propane bottle attached and the lantern lit, thirty steps away! We laughed, and pledged to never be that stupid again. By 10:30PM I finally had my buck hanging and skinned. Nicely cooled overnight, he was ready to be cut into eight pieces and transferred into an ice chest with frozen jugs before we left camp again. Daniel had his chance at a buck that morning. Under similar circumstances, deer running up an opposite slope about two hundred steps across, he missed twice, barely. The deer got away. We, however, will not forget this hunt with all our bad decisions.